Sara Evans sings it but the Lord originated the idea and how I pray His daughters believe it’s true: You were born to fly. But this world can do mean things and tear a girl’s wings by arranging elaborate pranks for the price of a wounded heart. And only our God can take a girl from a prank to a princess because that’s exactly what we all are: Golden daughters of the Glorious God-King. 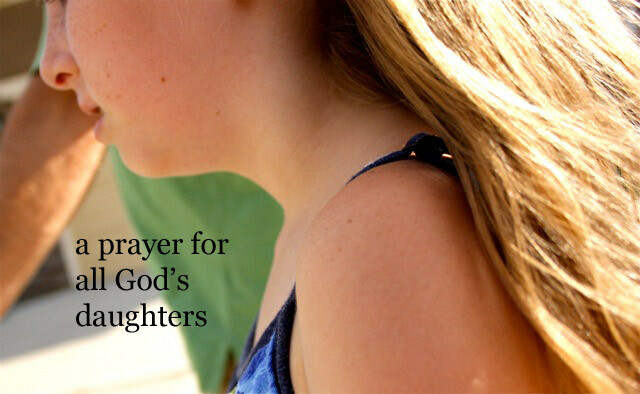 May His girls wallow in Truth not tears as we pray for each other. Thank you for this daughter. I pray she knows just how desperately she is valued and wanted by her family and You. I pray you whisper truth after truth to every hungry corner of her heart. May her confidence lie in unwavering Christ and not this wobbly-legged world . Give her a can-do spirit, not because of who she is but because of the One who is what she isn’t. Help me treat her as a friend today, since real friends keep the easy and hard truth central. May our hearts stay close now and when she grows. Show us how to relish relationship with one another and may that relationship always be rooted in Christ. May the only mirror she stares into be the one Jesus holds as He reminds her she is His beautiful,creative, intelligent, fierce, mighty wonder and work of art. May she see her value not overly or underly, but reality. Help her care more about what You think of her than anyone else, including me. Since You see her days stretched out from beginning to end, You know best what path she should take and when. May she be willing to trade more comfort for more Christ. Give her a head and a heart willing to hunt down Your will in the big and small. After she has done this, show me how I may encourage as a source of help rather than hindrance. Give her strength so her fears don’t become the boss of her. She will have fears, but don’t allow fears to have her. May she remember only the perfect love of Jesus drives out fear. Keep her heart tender to the things that move You, Lord. Childlike faith, joy, zest and even bravery can slip away with age like colors of a sunset. Help her choose You and Your light so darkness hasn’t a moment to settle in. May she hunger for your Word and never get her fill of the Bread of Life. Remind her to move onward and upward by recording her gifts because there is never a time to stop giving thanks. You are the giver of every good thing and You never stop being good. May she know she can’t ever sin further than Your forgiveness, and that You are the God of unlimited do-overs. Help her understand Your ways of grace and love endure beyond her every beyond. Download a free printable of this prayer here. And if you are looking for some excellent resources to encourage the young girls in your life, may I humbly recommend Emily P. Freeman’s Graceful and Annie F. Downs’ Perfectly Unique? Stellar books! And while they are geared towards young women, I am reading them for me as much as my own daughter because it’s never too late for a girl to learn solid truth about who she is as well as who she isn’t. I just love reading your posts!!!! You are such a dear. I love you. You encourage me, Christy. And so. much. gratitude for your prayers. They’re the best gift of all. So thankful for you! Angela! It always gives me goosebumps when my real life world collides with my online world. How fun to see you ’round these parts. Looking forward to meeting you SOON! Oh my word … this is beautiful. I’m printing it out and pasting it into the journal my girl and I pass back and forth! A journal to pass back and forth with your sweet girl? Brilliant! This prayer is exactly what this mama needs. I just moved my youngest daughter away to college and my heart is tender. Printing this prayer and praying everyday over my sweet girl. Thanks, friend! I’m thankful I found this today! I’m a mother of 2 daughter’s. The both have broken hearts that need healing and to find who they are in Christ! I pray for them daily and this is a good pray to add to my own! May God Bless you Kristen as God uses you to bless other’s! This prayers gave me so much piece. I lift my children to the Lord with faith n understsnding of his unconditional love. Mother of four is not the banner I fly but it is the one of faith in christ that draws me to mother through the hard times. I am boasting of gratefulness for answered prayers this morning. My youngest started high school and she is in the lonely season of friendship or lack there of and your words “when you’re waiting on God in a lonely season, were His beautiful answers to a small portion of prayers I have lifted up on her behalf and then to search more through your website I find the prayers for boys(the ones you forgot). It is such a beautiful morning when we can pray for the families God gives us but it is an even better morning when we get sweet answers. Thank you for your faith and sharing. The lord hit the sweet spot in my mama’s heart through your words.